Menorah showed he will be a tough nut to crack at the Festival meeting in March with a performance of real authority in the StanJames.com International Hurdle at Cheltenham. Philip Hobbs' charge (7-4 favourite) looked to be a little tapped for toe as Cue Card travelled powerfully up to join Silviniaco Conti, with the big three settling down for a battle. But Richard Johnson soon engaged top gear on the five-year-old and he sprinted between the two of them, putting the race to bed in an instant, with a spring-heeled leap at the last sealing victory from Cue Card by four and a half lengths. Johnson said: "He's definitely getting more grown up, that was the most impressive he has ever been. He saves himself now for the end of his races and he picked up really well off the bend. When the gap came he was able to go through it." Hobbs added: "It's good to see him do it when it matters. He was a little short of room round the last bend, but he showed a very good turn of foot. "We'll have to go for the Champion Hurdle and whether he runs again before that I don't know, we'll have to think about it. He has always kept going well in the past but he showed real pace there. He's probably still maturing, he's only a five-year-old. "He's one of the few you can say is a perfect racehorse - he has a fantastic attitude and temperament, anyone can ride him. He's not over-big and touch wood he is very sound. If he's not yet the best hurdler I've trained, he could end up being." 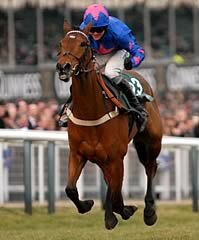 Cue Card, winner of the Champion Bumper but having only his third start over hurdles, emerged with great credit. 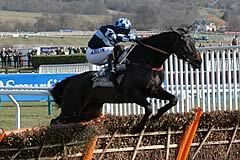 Trainer Colin Tizzard said: "He was beaten by a better horse on the day. He travelled well, just like normal, but Menorah went by him in four or five strides. He could have given up, but he stuck on well. We know where we are now. "He's a beautiful young horse. We'll leave it until Christmas before deciding where he goes in March - he'll have one more run in February somewhere. I'll speak to the owner (about plans)."